The rationale behind recently-proposed “solutions” to the housing affordability crisis that seek to reduce limits and regulation on high-end housing development policy is the theory of Filtering. According to filtering, maximizing the supply of housing at the high-end of the market will eventually result in housing that “trickles down,” with reduced prices to meet all affordability needs. This theory relies upon the deregulation of the real estate market, through actions such as eliminating local development approval processes, eliminating requirements on developers to contribute to infrastructure or affordable housing, or easing restrictions on demolitions of existing housing. Understanding why deregulation policies like the “by-right” one proposed by California Governor Jerry Brown (Streamlining Affordable Housing Approvals), which would ease the zoning approval process for housing developers and other market-based solutions, won’t actually make housing more affordable requires a closer examination of the filtering theory. If you haven’t heard of filtering, have no fear–the Council of Community Housing Organizations has created an info-graphic (below) that breaks down the basics of filtering, the assumptions behind it, and the reasons it doesn’t work the way some say it does. Please share it with your colleagues, and comment here if you’d like to weigh in with your own examples of why “filtering” is a fallacy. Peter and his organization are a laughingstock among real affordable housing advocates in the Bay Area because of nonsense like this. As an SF resident active in housing policy, I apologize that such delusion is coming from my city. The “by-right” policy derided by Peter and his cronies as some kind of extreme libertarian disaster is how housing development already works in 49 states and DC. Under by-right, local control in the form of zoning and building codes is enforced just like we are all used to, but if those codes are complied with 100%, the rules can’t arbitrarily be changed mid-game for subjective reasons – something only California allows, which gives NIMBY neighbors extraordinary opportunities to block housing projects and drive up rent prices to the exorbitant levels we have now. There is too much wrong in Peter’s infographic to cover it all, but follow any one of his sources and you’ll find they don’t agree with his conclusions. And the supposedly damning claim that producing adequate amounts of housing would ONLY lower rents by 0.3% per year? Considering we’ve been experiencing double-digit INCREASES per year, that sounds like a pretty significant improvement to most San Franciscans. I appreciate Peter Cohen’s and CCHO’s work advocating for non profit low income housing. However, I think Peter Cohen is wrong when he opposes market rate housing, opposes the Affordable Housing Bonus Plan, and opposes Governor Brown’s “By Right” I suppose he opposes President Obama’s Housing Toolkit as well. Filtering does work, just not as fast as Peter Cohen wants it to – a tree doesn’t grow huge overnight to offer shade, it takes years. But that’s not a reason to make a good cause now, and plant it. If we want to want to know what the future will look like, we need to look at the causes we are making now, Unless we build housing today, we won’t be able to meet tomorrow’s housing needs. As someone who profoundly and personally suffered immensely from housing unaffordability and spent several years homeless in San Francisco, I want actual proof that Cohen’s theories and ideology works – at present, the proof is only that San Francisco’s average rent in August 2016 was $3866 a month – meanwhile, in Tokyo, the average 2015 rent was $802 per month. That’s a huge difference! Whose housing policies are working, San Francisco’s or Tokyo’s? Like Cohen, I want affordable housing, but in my opinion, he is actually making the housing crisis worse by opposing by right, bonus plans, and simplified zoning and faster approvals. CCHO, Calvin Welch, Peter Cohen have had decades to make a difference, instead, the housing crisis has just gotten worse. We need to try something different which actually works. This article assumes that we need to make a choice between creating dedicated affordable housing and expanding market-rate development in order to ease affordability pressures. This is a false assumption. We clearly need to do both. Neither one, on their own, will solve the crisis of housing affordability in the nation’s high-demand cities. At the same time, we need to substantially expand the supply of market-rate housing in order to ease affordability pressures throughout the region and prevent rapid increases in rents and home prices in additional neighborhoods and at the regional scale. Why are rents and homes prices rising faster than incomes in high-demand regions? Because of a shortage of supply. If we don’t address the supply shortage, the problem will just get worse. If we truly care about making housing more affordable, we need to embrace rather than criticize efforts to expand the supply of housing. While it’s true that filtering hasn’t produced as much affordability as fast as we would like in high-demand areas, that’s not a reason to oppose it. Quite the opposite, it’s a reason to seek to accelerate it by promoting increases in market-rate development. The more housing you produce, the faster older housing will filter down in price. Is filtering a total solution? Of course not. There will always be people who cannot afford even low-cost housing and will need subsidies. And there will always be neighborhoods that are more popular than other neighborhoods where dedicated affordable housing will be needed (especially when those neighborhoods have good schools and other amenities that help children thrive). I would urge the affordable housing community to embrace an inclusive agenda that combines dedicated affordable housing with increased production of market-rate housing along with protections to help residents who may face displacement. If we fight each other, we will all lose. This infographic is helpful and makes sense. The ridiculing comments to this article seem to ignore that basic fact. One can accept the infographic but still have a difference of opinion about the defeated “by right” development proposal. How San Francisco goes about accommodating the desire to profit from real estate development while building a balanced accessible and livable city requires some will and actual commitment to make affordable housing happen, as it always has. Good luck, San Francisco. It may be too late for you because you’ve let it all go too far. You are a cautionary tale for the rest of the country. “This infographic is helpful and makes sense. The ridiculing comments to this article seem to ignore that basic fact. One can accept the infographic but still have a difference of opinion about the defeated “by right” development proposal. How San Francisco goes about accommodating the desire to profit from real estate development while building a balanced accessible and livable city requires some will and actual commitment to make affordable housing happen, as it always has. Livable for whom? The elites? The poor people can just live in decrepit villages on the Nevada border? I’ve had exchanges with Peter Cohen and others involved in the Twitter debate over San Francisco’s housing crisis. By definition, that platform isn’t always the best place to take a deep dive into every subject, or every point of evidence. So I want to echo comments above appreciating the nonprofit work that Cohen and others do for people in need of housing in San Francisco. At the same time, I want to push back against glaring flaws. Just because you string some sentences together and create a graphical representation of them doesn’t mean you’re being accurate. 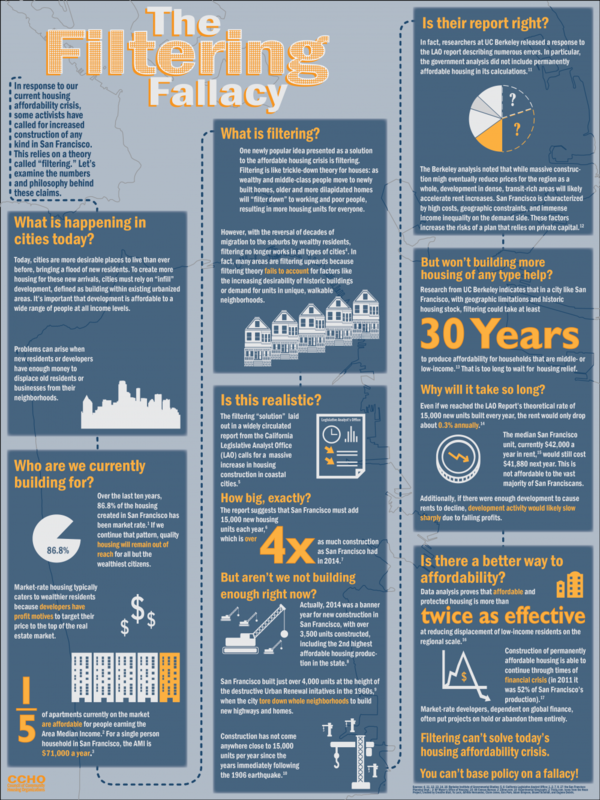 Right at the top, the so-called Filtering Fallacy infographic starts with a presupposition: that the housing market, by building almost exclusively at the market rate, won’t be able to house anyone but the wealthiest. It’s hard to know where to start unpacking this. SF’s rent-stabilization ordinance, generally speaking here, applies to units built before June 1979. Those very same units, generally speaking, were not built and rented at below market price back in their day. Yet they now are the city’s best examples of affordable housing, and they didn’t cost the city government or taxpayers a cent to bring to market. Will units built after 1979 one day be affordable? It might be too early to tell. If we build zero housing, though, I guarantee that units not covered by rent stabilization will continue to fetch higher rents. I guarantee that even rent-stabilized units will one day turn over and be priced at the eye-popping market rate. I’ll wrap up with the funding point I raised earlier. The main funding mechanism for affordable housing in San Francisco is from market-rate developers, which either set aside a certain percentage of units in their projects as affordable; build a set number of separate affordable units; or pay in-lieu fees into the affordable-housing piggy bank. How will San Francisco create affordable housing if the main mechanism for it is shut off? We are in a crisis that took decades of policy misdirection and neglect from various corners. If there’s one point that is accurate in the infographic, is that filtering by itself doesn’t solve our housing crisis, just like banning market-rate housing won’t solve it either. It’s high time to start making the hard but smart choices. In response to one of the commenter’s assertion that: “The main funding mechanism for affordable housing in San Francisco is from market-rate developers… How will San Francisco create affordable housing if the main mechanism for it is shut off?” First, pointing out the fallacy of believing we can solve our affordability crisis by building luxury units is not the same as saying we need to “shut down” market-rate housing. Rather, we believe we need to harness the profits in market-rate housing (and, by extension, the increment in land prices) as much as possible to provide real mixed-income communities and strive to achieve a true housing balance between affordable and market-rate housing. Second, while inclusionary fees may at times contribute significantly to the City’s budget for affordable housing, it is patently untrue that affordable production is dependent on market-rate development. The revenue from fees can be found in the City’s annual Housing Inventories, published by the Planning Dept. The revenue varies tremendously by year, depending on the economic cycle. Over the last 10 years (including two market spikes in 2008 and 2015, and the downturn of 2009-2012), the revenue from inclusionary fees averaged $18.8 million, enough to provide up-front local subsidies for about 75 units per year (at an average of $250,000 subsidy per unit). But in four of those years, inclusionary fees would have covered the construction of only 5 units per year! While the revenue in the up years is nothing to sneeze at, funding for affordable housing in San Francisco really depends on public sources, local and State and Federal. While the State and Federal governments have seen annual declines in direct subsidies for affordable housing, at the local level, the electorate in 2012established a general fund set aside to replace lost redevelopment funding and raised the City’s gross receipts tax for creating a 30-year Housing Trust Fund to the tune of $50 million per year, and in 2015 the voters passed a $310 million General Obligation bond for affordable housing. That’s how we fund affordable housing in San Francisco. While this funding continues to pale in the face of actual need, what this means is that in the down years of the economy, we continue to build affordable housing (in some recession years, our affordable housing balance exceeded 50%!, providing critical economic stimulus while private investment disappeared), while in the hot market cycle, despite the revenue provided by fees, the balance of affordable to market-rate housing shrinks tremendously. When we know that every high-paying tech job is accompanied by five additional jobs in other sectors, including many low-wage jobs in the service sector, a critical question is how to maintain that housing balance in the economic boom years. I want to thank Fernando Marti for setting the record straight on San Francisco’s funding sources for affordable housing, other than the nearly $188 million in in-lieu fees collected since 2006. But it appears we may be engaging in a semantic quibble, since Marti acknowledges that the in-lieu fees are significant and that municipalities are still reeling from the shuttering of redevelopment agencies. The issuing of bonds to support the construction of affordable housing requires more than a simple majority of votes, which means this can come up against broader, unpredictable political hurdles. (The Prop C bond measure on this November’s ballot, for example, requires at least a 2/3 margin to prevail.) Garnering fees when market-rate developers are eager to pay them, and then deploying the money to build housing when the market won’t, seems to be a feasible strategy. Thanks again for clarification on the funding sources. Frankly, both “sides” here have a piece of the puzzle but are ignoring the forest for the trees. Cohen takes issue with the idea that inclusionary zoning should be done away with and denies that filtering works. The market YIMBY folks like you on the other hand decry that supply is being constrained by both draconian single-family zoning and inclusionary zoning. The reality is a mix. Inclusionary zoning is necessary as without it there wouldn’t be money for the non-profit sector and cities would become more segregated than ever before. Single-family-only zoning needs to be eliminated and by-right zoning needs to be enacted. Filtering, trickle-down, whatever you want to call it on the other hand is likely false. There have been too many variables for the last 70 years to offer definitive proof of such an effect. The Fair Housing Act and white flight are partly responsible for some of the movement from expensive to affordable. Additionally, condo conversions are a thing and cities haven’t taken adequate steps to prevent them. The argument shouldn’t be a dichotomy of wholesale deregulation vs regulation. Some regulations are necessary to prevent segregation and some are causes of segregation and should be removed.